Will This Adorable Patrol Robot Ever Find What It's Looking For? 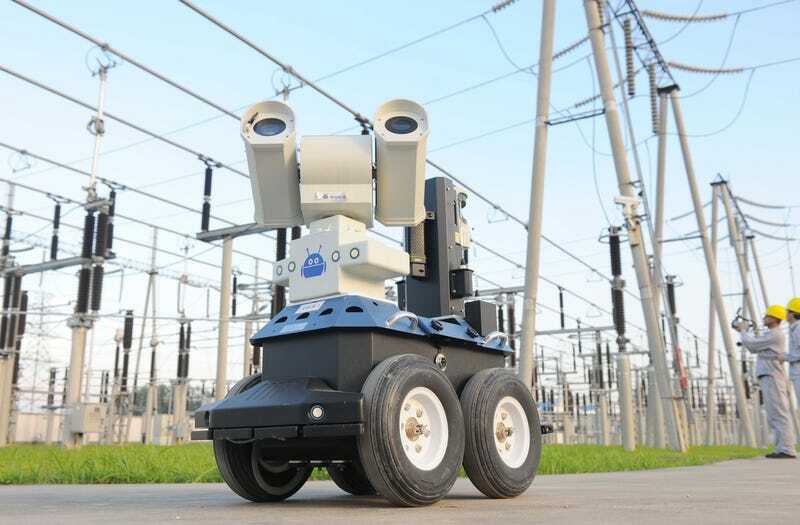 This little patrol robot was recently spotted at a transformer substation in Chuzhou, China. But will it ever find what it’s looking for? Maybe it’s over to the right. Nah, not there. Maybe it’ll find what it’s searching for over to its left. Not there either. Well, what if it gets a little closer while its human handlers go shoot video somewhere else? Wait! Could that be it? Just over there! False alarm. I guess that wasn’t it. Oh dear, that’s it, isn’t it? You found it. Oh, that’s absolutely horrifying. I can tell by the expression on your robotic face. This is just awful. I’m so, so sorry you had to see that. Is that what you were looking for? How did this happen? I can definitively say that I’ve never seen that much blood in one place before. I think I’m going to be sick. Humanity will never fully recover from this atrocity. Oh, the blood. So much blood. Is that really what you were programmed to find? I can’t look away. I want so badly to look away, but I can’t. How could we live in a world where something like this can persist without a just and righteous ruler to smite the wicked? So much blood. May God have mercy on our souls.